Parashat Ki-Tavo opens with the passage describing the Bikkurim/First fruits offering. The Talmud describes this offering as the centerpiece of Shavuot, the second of the major festivals. One can picture a humble farmer bringing precious first fruits to the Temple for this thanksgiving offering. The Torah provides a specific liturgical text to be said upon presenting this gift to the kohen/priest. The text notes the humble origins of the Israelites, their plight in Egypt as slaves, their miraculous freedom and their return to the Land of Israel. While this text was originally associated with this ritual on Shavuot, after the destruction of the Temple and the end of sacrifices, the rabbis re-appropriated this text as a central passage in the Passover Seder. 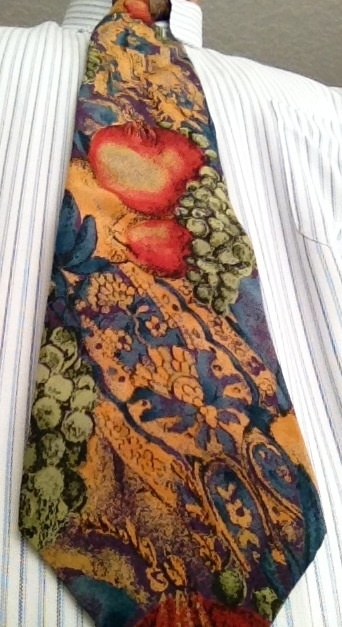 The cornucopia of fruit on this week’s tie represents the gift of first fruits.